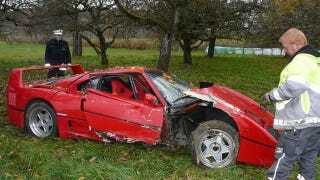 Recently an 80 year old businessman in South Germany lost control of his Ferrari F40 and hit a tree. As you can see, the resulting damage is far from a pretty sight. Amazingly, the only serious injuries as a result of the crash near the Swiss border were to the Ferrari. Police officers at the scene estimated the damage to be around € 250,000. We aren't overly confident in the German police's ability to properly appraise damaged supercars, but we know it certainly won't be cheap to rebuild this F40. Although GTspirit suggests the car might be totaled by the insurance company, given the rarity and popularity of the F40 we are pretty confident this car will eventually return to the road. Even with this in mind, seeing one of our childhood dream cars destroyed by an elderly supercar owner is a pretty painful sight.